You are an employee who wants to have a new car but not financial support? Please do not be sad. One alternative is to buy a used car. Indeed, sometimes a lot of outstanding issues if the used car was quickly broken. In fact there are buyers who apes; The new buy but have to spend millions of rupiah for maintenance or replace the engine. However, do not always see the eyes of the used car. Carefully before buying is key. If you buy carefully, you will get a quality used cars. To help you choose the car as it was, the following 9 tips you need to know. The first thing you should do is look for information about used cars, both online and offline. Many used car selling sites that provide information on various brands, price, year and the specifications. Read automotive magazines and discuss with mechanical or friends who know about cars could also be part of the research. Find out the price, the year, and the specifications of the car you want. Notes and learn such information to allow you time to see the car in person. This knowledge can help you take the right decision to choose a quality second car. The first person is the owner of the car. Instead of buying a used car from a dealership, showroom or broker, you should find cars for sale by owner. Buy from the showroom does provide a lot of options, but you can not dig up background information about the car directly from the owner. In addition, buying directly from the owners make the price becomes cheaper. In this case, the buyers and sellers to transact directly without division to a third party such as a broker or showroom. Where these furthest I've ever taken? Besides you, who often use this car? Is this car never had an accident? How many times a year you do a service? Are certain parts ever be replaced? When and why? Why do you sell this car? If there is any question that you think need to be submitted to the owner of the car, please added. After getting answers to your questions, start checking the car. Previously, ask for permission to the owner of the car to check the vehicle. 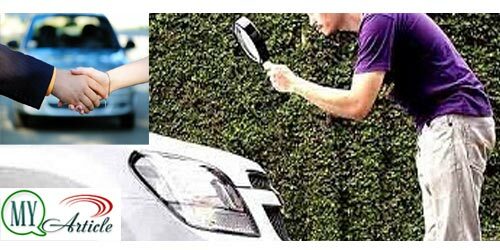 By doing a physical check, you will soon find out the honesty of the owner of the car. Note the condition of the car paint, is still smooth or no rust spots, scratches, dents, or used fillings. Pay attention to every detail of the car body, from front to back, from top to bottom, from right to left. Note also the ceiling (the top of the car). The ceiling is still good is still thick because it will protect the air temperature inside the car, especially during the day. In addition, note the four tires, whether it was good or already started to wear out. If there is thinning, of course you have to spend more money to replace it. Once you are satisfied to see the outside of the car, it's time you checked out the car's engine. Of course this step which is the hardest part when you do not understand about the major automotive and property should be in the car. When in doubt, ask a mechanic or a friend who understands to help you check out the car's engine. Examine the inside of the hood such as hoses and make sure all are free of leaks and corrosion. Open the lid and check if the engine oil is no trace of froth which indicates a leak. After that, pick up the transmission oil measuring stick and make sure the color red or pink oil and oil in full. After checking the body and engine, go into the car. Check the upholstery and the holster. Turn on the ignition and turn on the AC to determine whether it is still functioning properly. Then check the odometer to see the mileage. The condition is to have a good car mileage is normal, not too much or too little. In normal conditions, an average driver will cover a distance of 16,000 to 24,000 km in a year. Another thing you should do is make sure all the lights are working properly, including other equipment such as radio, CD, TV, parking sensors and cameras (if any). Other tips for choosing quality used cars are trying to drive a car or test drive. By driving the car, will allow you to check the comfort and state of the brake, which became one of the most critical components of a car. When you put the brakes at a speed of 50 km / h, there should be no vibration in the brake pedal or the sound squealed. If this happens, you should be discouraged to buy this car, unless it gets an appropriate price negotiations, for brake repair costs. After checking in detail and do a test drive, you can ask for equipment or tools (tool kit) such as screwdrivers and keys are included in the used-car sales. This tool is very useful as a tool inventory in emergencies, such as breaking down in the middle of the road. If you got an extra gear without increasing the selling price of the car, of course this will greatly save. So, you do not need to spend extra money to buy the equipment, do not you? Next, you should note that auto insurance. Of course it would be an added value for you if the car has been insured. Ask the owner shows the card or official document stating that the car is insured. The process behind the name can be made throughout the document and a complete purchasing letter. So, before making a payment, you must equip themselves with letters and documents of sale are complete and legal (sealed). Additionally, ask the car salesman copy of ID for your records.